Adams, Gut & Associates is a team of highly experienced, devoted professionals with a commitment to serving our clients. We are a multi-disciplinary group of individuals working interdependently for the benefit of our clients. Our focus is taking care of people. We always serve our clients to the best of our abilities, which is why we are committed to continuous education and growth. We understand that by striving to constantly improve, we will be better equipped to serve our clients and their families for generations. John Adams carefully cultivates client relationships as a means of remaining in touch with evolving needs and maintaining alignment between today’s life and tomorrow’s goals. Similarly John believes in continuing education to keep the professional edge that makes him a valuable resource. Complementing his continual quest for improvement is a dedication to honesty and integrity in all business dealings. 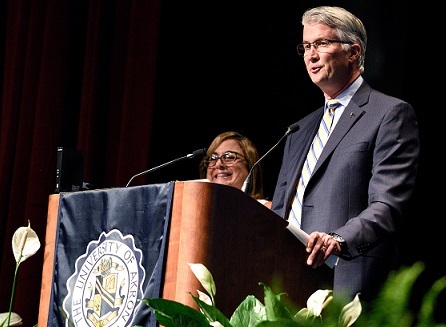 John Adams began his association with the Northwestern Mutual as an intern in 1987 before graduating from The University Akron the following year and embarking on his career. John graduated with Bachelor of Science in Business. From 1995 through 1999, he served on the Disability Insurance Committee of the Financial Representatives Association (FRA), including two years as Chairman. Other FRA offices John Adams has held include At-Large Board Member (1999-2001), Vice President and Treasurer (2001-2002) and Chairman of the Marketing Committee (2003-2005). John Adams has earned a number of professional designations including Chartered Life Underwriter (CLU®), the highest level of studies in the life insurance profession; Chartered Financial Consultant (ChFC®), the most extensive education for financial solutions professionals; Chartered Advisor for Senior Living (CASL®), an expertise dedicated to the full range of financial, health, psychological and sociological issues confronting older individuals; Certified in Long Term Care (CLTC), Retirement Income Certified Professional (RICP™), and CERTIFIED FINANCIAL PLANNER™ (CFP®), a distinction for financial planners rooted in education, examination, experience and ethics. John Adams is a member of the National Association of Insurance and Financial Advisors (NAIFA), a national nonprofit organization representing the interests of more than 70,000 insurance and financial advisors nationwide, through its federation of over 900 state and local associations. Founded in 1890, NAIFA is the nation's largest financial services membership association. John Adams is a 2015 National Quality Awards qualifier (NQA 1995-2010 and NAIFA Quality Award 2011-2015). The National Quality Award was created in 1944. The award recognizes agents whose persistency records indicate competence and dedication to the insurance industry and their clients. Agents who win this award have tangible evidence signifying that the products they sell will meet clients' needs. John is also a qualifying/life member of the Million Dollar Round Table (2004-2015). MDRT is The Premier Association of Financial Professionals. Founded in 1927, MDRT provides its members with resources to improve their technical knowledge, sales and client service while maintaining a culture of high ethical standards. John Adams is a current member of the Akron Tax and Estate Planning Council. Dan began his career in personal financial services in 2003 and gained several years of experience in executive benefit planning. In 2014 he began working with John Adams and they formed Adams, Gut & Associates. As an associate wealth management advisor with John, he co-leads the team in training and development. Dan's commitment to serve in a fiduciary capacity and his passion for continuing education are evident. He holds the following professional designations and licenses: Chartered Life Underwriter (CLU®) and CERTIFIED FINANCIAL PLANNER™ (CFP®), Life, Accident and Health insurance; Series 6, 63 and 7 securities. Dan and his wife Alicia live in Medina and enjoy raising their five kids, Connor, Owen, Lilly, Ella and Harper. In his spare time, Dan volunteers with the mentoring program KidsHope in the Medina City School system and acts as the principal of his family's homeschool. He very much enjoys cooking for his family and sharing new recipes. Dan works closely with our clients to provide excellent planning and support, participating in both behind-the-scenes planning, and meeting clients face-to-face or speaking with them over the phone. His 15 years of financial planning and executive benefit experience makes him a great partner as we engage in the lifelong planning process with our clients. Alex, our Director of Planning, started working in financial services as an intern and later joined our team full-time in 2014. He is responsible for generating our planning analyses, insurance policy illustrations as well as assisting in formulating client recommendations and servicing of insurance-related requests. He ensures excellent client service and is a partner in daily client meeting preparation for our growing practice. Alex holds his life, accident and health insurance licenses as well as his Series 6, 63 and 7 investment licenses. Alex enjoys the arts, politics and spending time with family. Jennifer, our Chief Operations Officer and Workflow Manager has been an integral member of the team since 1999. She is responsible for office management, human resources and maintaining compliance procedures. An important part of Jennifer's role is handling the opening and processing of accounts as well as developing and updating proposals. She ensures excellent client service in all aspects of our business and is a partner in daily client meeting preparations for our growing practice. Jennifer holds her Life, Accident and Health licenses as well as her Series 6 investment license. She lives in Akron with her two daughters, enjoys spending time with family, watching softball and going to the beach. Caroline joined our team in mid-2016 and is focused on enhancing our client experience. She graduated from The University of Akron with a Bachelor’s of Science in Early Childhood Education and a minor in dance. She has traveled throughout Latin America and is fluent in Spanish as well. Caroline has eight years of experience in marketing and customer relations. Caroline's marketing savvy, language skills and dedication to relationship building make her a valuable member of our team. She is responsible for scheduling, calendar management, maintaining our social media presence, organizing our community involvement efforts, and creating memborable client appreciation events. Caroline lives in Cuyahoga Falls with her husband and son. She enjoys spending time with her family, teaching fitness classes and traveling. How can Caroline help you?